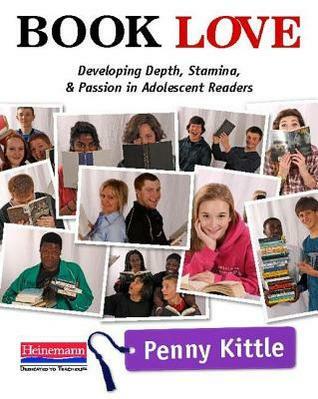 Today we are thrilled to talk about Penny Kittle's Book Love! We both loved this book and have so much to share about it and what it means to us and our work. Penny Kittle wants us to face the hard truths every English teacher fears: too many kids don't read the assigned texts, and some even manage to slip by without having ever read a single book by the time they graduate. As middle and high school reading declines, college professors lament students' inability to comprehend and analyze complex texts, while the rest of us wonder: what do we lose as a society when so many of our high school graduates have no interest in reading anything? In Book Love Penny takes student apathy head on, first by recognizing why students don't read and then showing us that when we give kids books that are right for them, along with time to read and regular response to their thinking, we can create a pathway to satisfying reading that leads to more challenging literature and ultimately, a love of reading. With a clear eye on the reality of today's classrooms, Penny provides practical strategies and advice on: increasing volume, capacity, and complexity over time creating a balance of independent reading, text study, and novel study helping students deepen their thinking through writing about reading building a classroom library with themes that matter to 21st century kids. Book Love is a call to arms for putting every single kid, no exceptions allowed, on a personal reading journey. But much more than that, it's a powerful reminder of why we became English teachers in the first place: our passion for books. Books matter. Stories heal. The right book in the hands of a kid can change a life forever. We can't wait for anyone else to teach our students a love of books-it's up to us and the time is now. If not you, who? Book love--pass it on. What Kellee Thinks: If you are like me, there are times when I question what I am doing and how I am doing it. Sometimes when I am working harder than others around me or if I do things a bit differently or I stand up for my belief in certain things, I wonder if I am really doing all of this right. Book Love is one of those books that will remind you that you are in the right and what I am doing is what is best for my students and will make a difference in the end. Penny Kittle takes us through how she makes a difference in her classroom taking us through her procedures for everything reading from reading hurdles, nonreaders, building stamina, fluency, book talks, conferences, responses, and building a community. Through each of these topics, and many more, she shares with us what has worked in her classroom. I felt like she was talking to me and about my kids because what she encounters is definitely universal: Why do students not read what is assigned to them? ; How can we get students to enjoy reading? ; How do we monitor our students' reading effectively? ; How can we get kids to read over the summer? ; How can we make our room/school a reading community? and so much more. Remember: If you are ever questioning yourself, pick up Book Love, give yourself a hug, and remember that you are doing what is best for the kids! What Jen Thinks: I love what Kellee shares above about doing what is best for kids. Teaching truly is about doing the best for our students. It is clear that Penny cares about her students. While the title of the book is Book Love, it could easily be titled For the Love of Students. Because that's what it comes down to. By taking the time to get to know her students and thoughtfully making decisions based on what she knows about them, Penny shows how highly she regards her students and how dedicated she is to giving them what they need to grow as readers and writers. The work that I do now is in supporting new teachers in my district. I work with the beginning new teachers and experienced new teachers. Our overall goal is to give new teachers what they need to feel confident and motivated because research shows that a motivated teacher directly influences the motivation of students. I often think about new teachers and the difficult line they walk coming to a new school, whether they have experience or not. The dynamics of teaching are changing. Teaching isn't only about working with students, it's also about sharing and collaborating and working with other teachers. I think this is great but I also believe that for teachers who are doing things differently or who are breaking the mold of how things have been done before or who are challenging other teachers to think about why they do what they do, this might be hard. I think this is what Kellee is referring to in her comments above. It's hard to trust and believe in what you are doing when it seems like you are the only one doing things that way. I love that she has Penny's book to remind her that if what you are doing is for the good of the students, then you're doing it right. Let the evidence of students reading more, students talking about text, students sharing ideas, and students' attitude towards reading be the evidence that also reassures you that you are doing what is best for students. There are two things that really stuck with me after reading Book Love. One is the idea of recording students' thoughts and ideas about their reading. I've been wanting to use my iPad more and have been working a lot with Evernote. I love the idea of interviewing and conferring and recording what students have to say either by typing them into a note or recording them. What better evidence to guide teaching but also to share with parents, colleagues and administrators about students needs and progress? Secondly, I love how Penny ties reading to writing. With Teachers Write, I believe now more than ever, that reading and writing are so connected and that we need to help students read as writers. I'm sure I'll do another post about this during Teachers Write this summer. Like Kellee, I have a lot of quotes that resonated with me from Book Love. These three are my favorites in regards to keeping students' needs as our primary goal and in believing that we are doing our best work when we do keep students' needs in mind. If you haven't read Book Love yet, we wholeheartedly recommend it! If you have read Book Love, please share what resonated most with you as you read it!